CAPTURE THE HAPPIEST MOMENTS OF YOUR LIFE: Getting married is one of the greatest, most important moments of our lives. 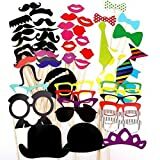 Now, thanks to these amazing bachelorette photo booth props you can take the funniest pictures and keep these amazing, happy memories alive forever. WIDE VARIETY OF PATTERNS AND DESIGNS: The Alohha Fun bridal shower, funny photo booth props feature many different shapes and carry unique slogans. The kit includes 58Pcs props that will make you and your guests laugh hard. Real Glitter is used that will NOT cause a mess! VERY EASY TO ASSEMBLE: This unique bride photo booth props set includes 58 wooden dowels. You will need to attach the props on the dowels with a few simple moves and you will be ready for the party of your life. Mainly includes moustaches, colorful eye glasses, red lips, bow ties, hat, smoking pipes, etc. Can be used on Wedding, Prom, Birthday and any other parties. Are you still taking photos with boring silly postures? Are you afraid your party will be too plain? You don’t know what to do when being taken a photo? This Photo Booth Props set provides you an escape! This props set includes tiaras, crowns, top hats, “feel like a sir” mustaches, old fashion glasses, costume masks, funny glasses, lips and ties. Extra unique pieces like bunny hats and roses are also included. This product would be a wonderful gift to bring huge fun to a wedding ceremony, graduation party, family reunion, halloween party and Christmas Party etc. The set comes in a decent transparent plastic box with safe smooth rounded wooden sticks and efficient glue dots sheets. The props are well protected on square card stocks with the shape pre-cut. They are super easy to be applied onto sticks and resistant to bending. Try out this props set and enjoy your special party!